I wrote in the Huffington Post a few weeks ago about the Democrats' uncanny ability to never, ever, be on the same page with each other. If some Democrats want single-payer health care, a loud and vocal minority will pledge to fight "Obamacare." But none of this is more embodied in one single man than President Obama, who today has announced that he will enact a seven year ban on drilling in the eastern Gulf and the Atlantic coastline. I don't disagree with this move; in fact I think it's absolutely the right thing to do. It shouldn't even be a question, especially considering that he was against it during his 2008 campaign. What irks me is the completely equivocal way that Obama reached this decision. Back in March Obama announced that he would be opening up the eastern portion of the Gulf as well as a sizable chunk of the Atlantic coastline for offshore drilling. Now he's not going to do that, opening himself up to (legitimate) criticism of flip-flopping. The administration is saying that the Deepwater Horizon disaster was the main factor in the decision, but then why did it take months after the spill was even "contained" to announce this? Did he think that is sufficient time passed that we would forget what he had said in March? Was it even a question after the Deepwater Horizon debacle to allow this kind of drilling? But that's just Obama. His Guantanamo failure and his wavering on health care are just two more examples of his inability to make a decision and simply stick to it. Look at "Don't Ask, Don't Tell." He has Justice fight a DADT repeal all the while saying that he supports the repeal of it. The argument for this dichotomous stance was that it is tradition for Justice to fight for Congressional legislation even if they believe it to be unconstitutional or against the president's wishes. So using traditional and illogical tactics to repeal a traditional and illogical measure. Because that makes sense. 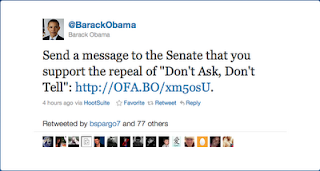 So when I saw Obama's tweet this morning about DADT, I about lost it. 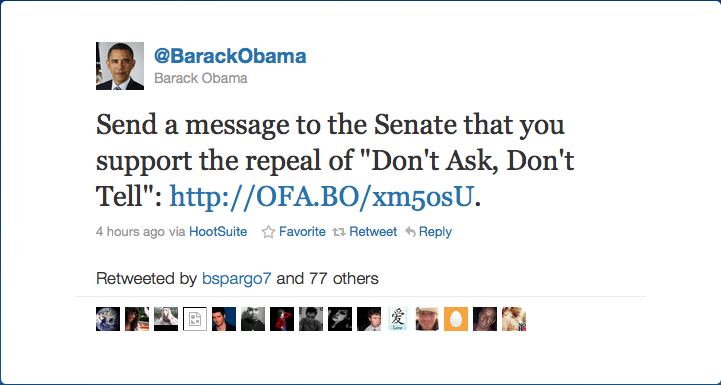 In it he says, "Send a message to the Senate that you support the repeal of 'Don't Ask, Don't Tell': http://OFA.BO/xm5osU." He is the president of the country and has had people under him fighting to keep DADT, yet he wants the American public to call their senators to let them know that they should repeal it. It's like planting land mines across a field and then wondering why people think it's so difficult to traverse it. So, just to be clear, Obama was for an offshore drilling ban before he was against it and then for it again. He wants DADT repealed but will allow Justice to argue that it should not be repealed. George Bush was for Iraq and was never against it and that's why we're there. He is for waterboarding and was never against it and will probably never be prosecuted for it. In politics it doesn't matter who's right or wrong, as the previous administration made painfully obvious to this country. It matters who can get things done. So my advice to the president is this: when you make a decision, stick to it.